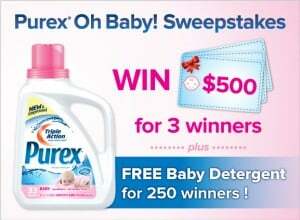 Click here to visit the Purex site and fill out the form to enter to win either $500 or free Purex detergent. Three grand prize winner will win the $500 in the form of a check or gift card and 250 will win a coupon for a free 50oz Bottle of Purex Baby Detergent. You can enter daily through January 25th. Good luck!